The Juneau Empire is bringing back its weekly Outdoors section after a yearlong hiatus, part of our effort to regrow the newspaper after a long, difficult period of cutbacks. Most of this growth has been hard - it means more hours in the cubical for me, more stress for my design team and more work in general. But the good thing about our new section is it gives me an excuse to write a weekly trails column, something I have always wanted to do. Juneau is surrounded by great trails, and information about them is limited (meaning there's not much on the Internet.) But I could write about a different one every week for a year, and not run out of places to write about. Klas and I headed up Mount Jumbo today to do a little recon for my first column. Actually, he just wanted to get one more climb in before the Klondike Road Relay, and I didn't actually need to do any recon because I was just up there on Sunday. But when a friend suggests a fun outing, I'm not inclined to say no. Even when the weather is terrible, as it it was today - windy, rainy and mostly fogged in. I always have a hard time making the transition from summer to fall in terms of clothing. This is the time of year that I keep dressing for summer and pay for it when I reach wind-blasted ridges, where air temperatures are in the 40s, soaking wet. I always come down with my worst bouts of hypothermia in the fall. Then I wise up and winter becomes quite the cozy season. 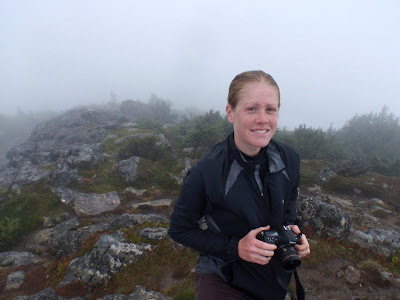 But I finished up my first column, still unedited, and thought I'd stick it up on the Internet for Google to crawl, and maybe inspire someone else in Juneau to trek up this cold, cloudy peak. Do you hear that pitter-patter on your roof, the slow drip on the sidewalk? That’s the sound of autumn. It’s here. Yes, I hate to be the one to deliver the bad news, but summer is over. And it won’t be long now — just weeks, perhaps even days — before the first termination dust coats Juneau’s skyline. After that, the mountains become significantly less accessible, so now is the time to bag those peaks you didn’t have a chance to summit when summer was hot and spectacular and you spent your days lounging in your swim suit on Sandy Beach. If you have time to bag only one peak this season, I strongly recommend Mount Jumbo (also known as Mount Bradley) on Douglas Island. 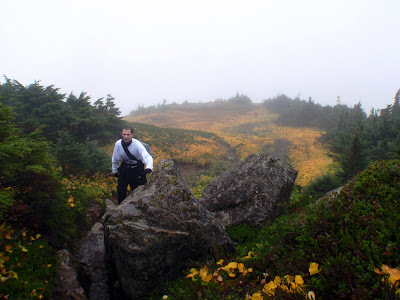 All of Juneau’s prominent peaks are stunning, but Mount Jumbo has the added benefits of being readily accessible, a shorter hike than most, with a well-established trail that crosses a range of scenic landscapes including rain forest, muskeg and colorful, autumn-hued alpine. The trailhead is located on Fifth Street in Douglas. The first mile is a moderately easy jaunt through the rain forest on a fairly wide trail, followed by a walk across muskeg on single-plank boardwalk (Beware: It’s very slippery when wet, and almost always wet.) After leaving the muskeg, the route climbs steeply up an eroded, root-clogged trail. I have heard it compared to “walking up a ladder,” or “an endless Stairmaster.” The roots do provide nice steps and handholds, which help limit sliding as hikers gain a gut-busting 2,500 feet of elevation in the next mile and a half. The trail leaves the woods about a half mile from the summit. From here, views of downtown Juneau become apparent, and on clear days, the numerous peaks that dot the Juneau Icefield also pop into view. The trail crosses a saddle and continues climbing up a steep, rocky drainage. Look for piles of rocks, or cairns, as the route isn’t always apparent. The final pitch is a scramble to a false summit, followed by a short drop and climb to the summit, 3,337 feet above sea level. Rewarding the effort are spectacular views of Admiralty Island and Stephen’s Passage, downtown Juneau, Gastineau Channel and the Mount Roberts ridge. Perched high on the narrow spine of Douglas Island, Mount Jumbo offers what is perhaps the best 360-degree panorama in town. 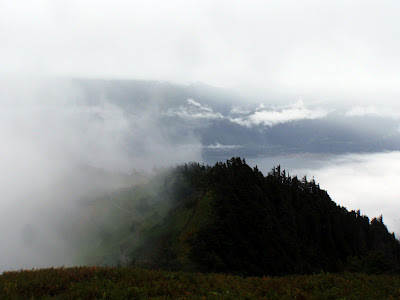 The trail can be slippery when muddy, and clouds can choke out the views, so it is best not to attempt to climb Mount Jumbo in the rain. Budget at least three hours for the five-mile hike if you are feeling ambitious, and closer to six if you’d like to take your time (that is, take breaks.) This time of year, plan for cool temperatures and sub-freezing windchills, and carry rain gear. There is no snow on the ground, but wet vegetation can be slippery, so trekking poles also are a good thing to have. But whatever you do, don’t wait. Winter is coming. Distance: About five miles round trip. Getting there: The trailhead is located off Fifth Street in Douglas. To get there, go straight on St. Anns Avenue and take a right on Summers Street, then a left on Fifth Street. The trailhead is sandwiched between two houses on the right side of the street. For more information: Visit www.juneautrails.org. As an advocate of print journalism all my life I find it harder and harder to advocate for print anymore. Papers don't stand up for what's right, any more than broadcast journalism ever did. And lazy writing leaves me less than super stoked. Great column Jill. Makes me want to move to Juneau just so I can summit Mt. Jumbo. Great news on the column and outdoor section of the Empire. Ignore Conchscooters comments. He/she may have a point about some papers and journalists, but it's kind of hard to have a beef about what you and the Empire are trying to do with the new section and column. Climbing a mountain and writing about it isn't "lazy writing". Hi Jill, I'm a long time reader and thought I'd let you know that the new trail column is a great idea. Not only will it be useful to locals, but it could be a huge resource for southerns looking to head to Juneau for a visit and some trail time. Hopefully, the reports will be collected into a comprehensive resource on the newspaper or your website. A Nikon!?! When did that happen? The camera isn't mine, sadly. It belong to Klas. I was taking a picture of him with his camera as he took a picture of me with mine. I'm still rocking the Olympus Stylus, although I am starting to think about purchasing a higher-end camera. I'm just so worried that I'll break it, or be too worried about breaking it to actually carry it anywhere interesting. But do you have any recommendations? Great article. Anything that encourages someone who may not otherwise go out of doors and do something in nature is a very valuable work. I wrote an outdoor/adventure column for a weekly paper a few years ago and followed a similar format with my articles. Man I miss those days of writing about places/people/experiences that actually meant something to me. Anyway, congrats on the column. These are the articles that a well-rounded paper needs. I can only handle so much content about what the school board has decided and what the latest tax scandal is all about. Keep it up. The weekly column is a great idea to help re-grow the paper. content that is specific to the audience and can't be found on the web....perfect! One of the things I really enjoy about your blog is the amazing photos. I recently upgraded to a nice SLR camera but never bring it with me on rides as I'm afraid I'll break it so I end up using the little point and shoot almost exclusively. I like the looks of the new Pentax K7 - it's weatherproof and small for a DSLR - but I'm biased because I already have a couple old Pentax lenses. Before I make the leap, though, I'm pondering the issue OldNSlo mentions: Would I carry it with me? My recommendation would be to wait a couple months to see what's coming out (or what prices are dropping) for the holiday season. Never mind the naysayers. I like to hold something in my hands and read it every now and again Jill. Jill, keep the waterproof camera for your jaunts. Its not worth the danger of messin up an SLR (my opinion) However.....if you are JUST going out on a shoot, thats a different story. good article, Jill. Happy to see it coming out in the Empire. I want to talk to you more about the Grandchild Peaks access....always wanted to go back there. 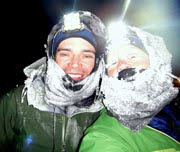 You inspired Bryan and I to head out there the next halfway decent weekend this fall. Will we see you on the Klondike this weekend??? Awesome. Sounds like the column you were born to write. I carry my Nikon D90 everywhere I go and I do a lot of hiking/biking. Don't pay attention to anyone who tells you not to take a camera out in the rain. They obviously don't live in Juneau. My secret: Get one of those disposable shower caps they give out at hotels and keep it wrapped around your camera body...and pad a daypack with a sweater (that you might need later) to cushion your camera. And stick with a good all purpose lens so you don't have to go changing them (18-200mm). just to jump in on the camera question (even though you didn't ask me specifically), i always say the best camera is the one you have in your hand (the same is said about the best bear gun). as a photography teacher i own enough photo gear to sink a packraft, but i often find myself with my olympus stylus for its portability and durability. i'm hoping that will change with my newest purchase (nikon d700). its difficult to justify the weight though sometimes.